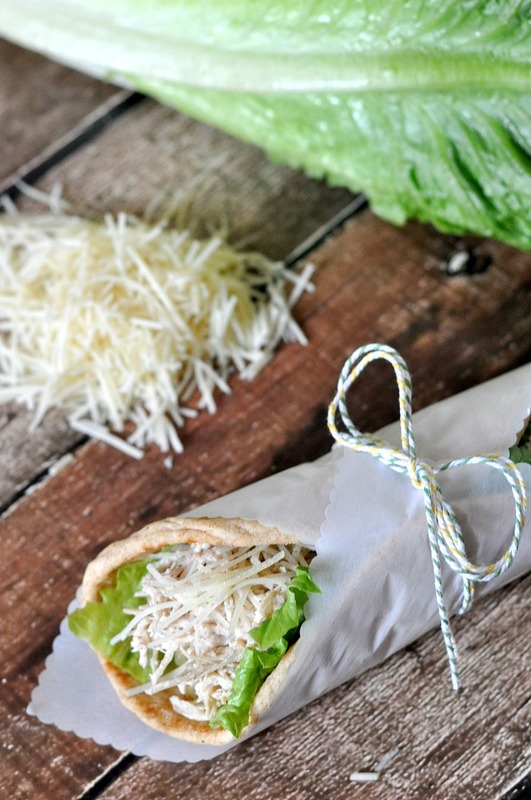 Easy and delicious Crock Pot Chicken Caesar Pitas! As we move into summer, I’m really looking for easy and lighter dinner ideas.. While I love a good casserole or baked mac and cheese, I don’t want such heavy food in my system. Plus I don’t need help from the oven in keeping our apartment hot during the warm months. This Crock Pot Chicken Caesar is just the ticket! Easy? Check! Throw the chicken into the crock pot with some chicken broth to cook and just quickly shred and pour caesar dressing on it when done. Delicious? You bet! Versatile? YES! 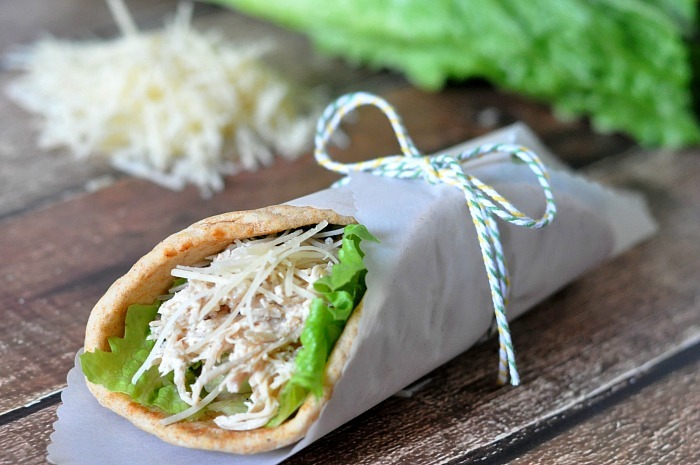 While I love enjoying this as Crock Pot Chicken Caesar Pitas, it can be served up lots of different ways to change things up. Use the chicken on buns, in a tortilla wrap or go carb free with a lettuce wrap! Or, go my way and use super soft whole grain pitas. I use light caesar dressing and go with the less is more philosophy (more dressing can always be added but not taken away). Plus, one pita is definitely filling for me! I ate one pita with carrots on the side only a couple nights ago which felt perfect. The real test is always what Bryan thinks though. As someone that runs and works out in general all the time, he can sometimes be a bottomless pit, so I was surprised when he said ONE pita was filling for him. Win! 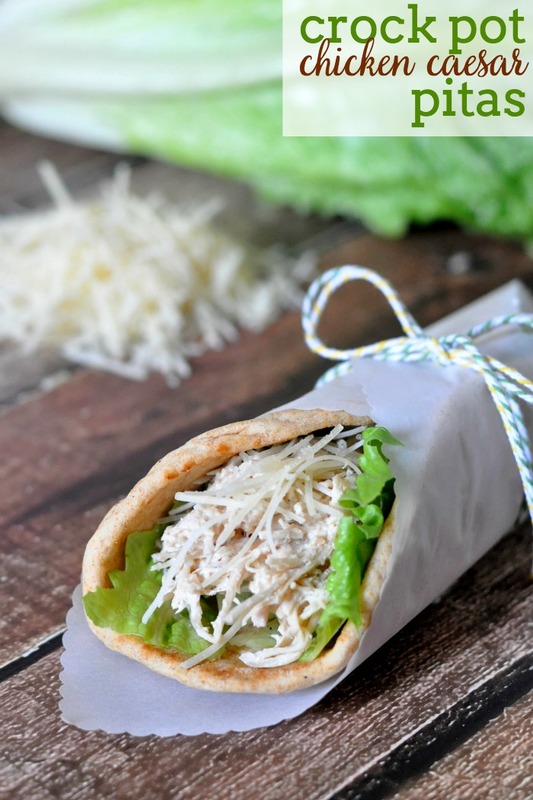 Crock Pot Chicken Caesar Pitas are perfect for summer - easy to make, light, cooked in a slow cooker and DELICIOUS! 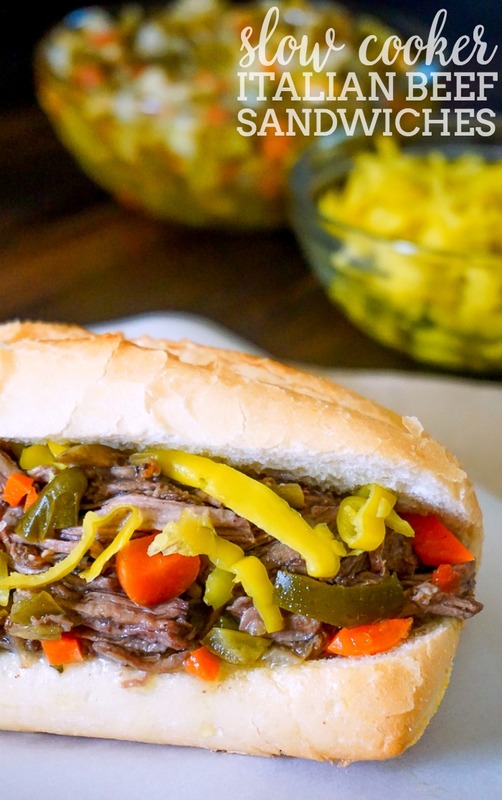 Plus, it makes great leftovers! Place cleaned chicken into the crock pot and add chicken stock. Chicken stock should come to the top of the chicken. I also sprinkle garlic powder on top. Cook chicken on chicken for 3- 4 hours on high and 5-6 hours on low. Shred the chicken when ready and pour on caesar dressing. This will be to taste. I use around half a bottle of dressing on all the chicken. Remember - more can always be added later! 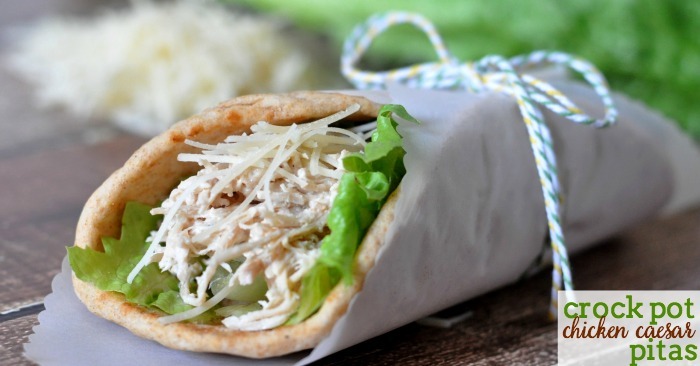 Add lettuce and chicken to the pita, then top with parmesan cheese! Enjoy! 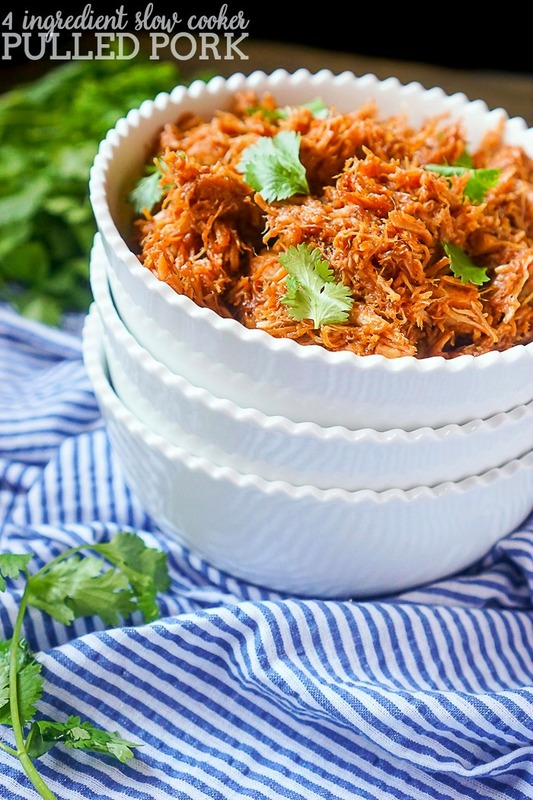 You can always make a big batch of shredded chicken to use for multiple recipes. For example, you can use the shredded chicken to make Chicken Burrito Bowls (another lighter meal perfect for summer! 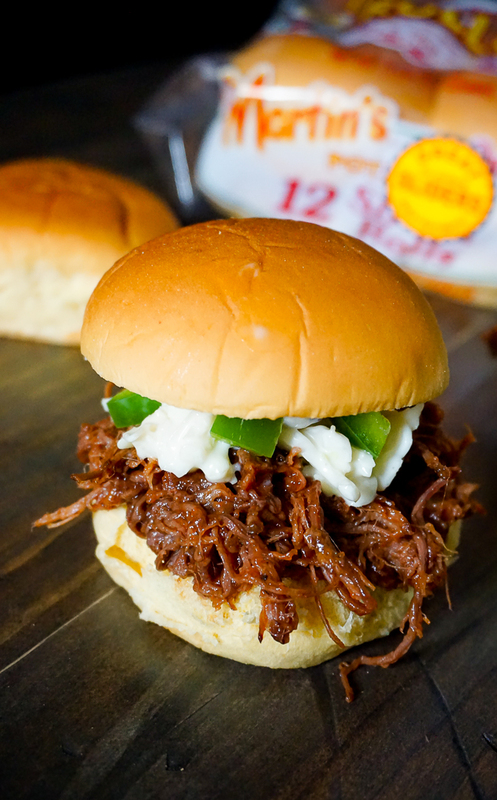 ), Easy Chicken Enchiladas, or BBQ Pulled Chicken instead of my 4 Ingredient Slow Cooker Pulled Pork. For more ideas, check out my most popular round up of Over 20 Dinner Recipes using Leftover Chicken! Be kind. Personal thoughts on bullying.